The results of Round 3 were by far the most surprising of March Music Madness. One friend of the station had referred to Beethoven's 5th Symphony as the "Duke University" of this bracket. 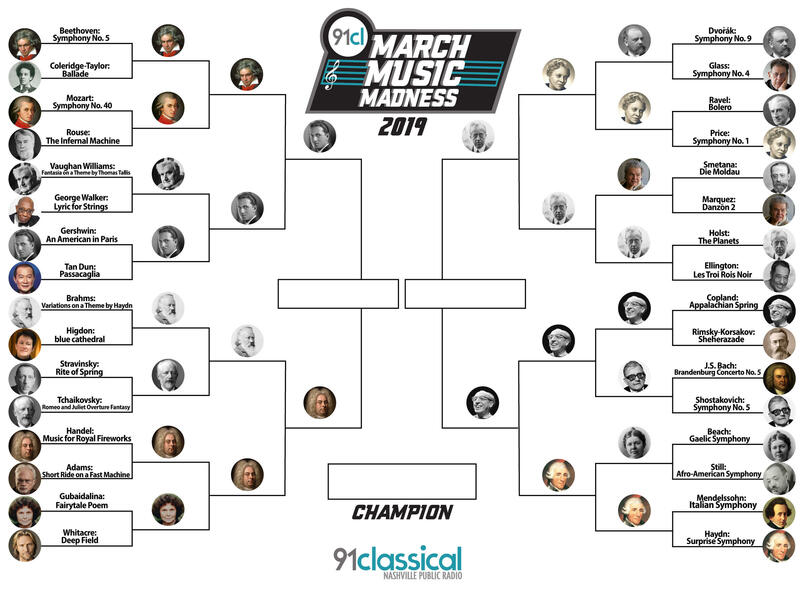 It may have taken a few rounds, but Beethoven was unseated by George Gershwin's An American In Paris. The Cinderella story of the tournament has been Florence Price's Symphony No. 1. Price wrote the piece while recovering from a broken foot - a situation that forced her to be sedentary for a while. It won first prize in the Rodman Wanamaker Competition, earning her $500. But today it was not a winner - instead falling to Gustav Holst's The Planets. Johannes Brahms originally composed his Variations on a Theme by Haydn as a piece for two pianos, but orchestrated it so quickly that the opus numbers are in reverse of the chronology. The theme, which is labeled Saint Anthony Chorale, likely wasn't written by Haydn at all. And it was defeated by George Frederic Handel's Music for the Royal Fireworks. Franz Josef Haydn's Symphony No. 94 is known as the "Surprise Symphony" because of the subito fortissimo (translation: suddenly LOUD!) in the second movement. Just one of the composer's many famous musical jokes. The theme of this movement reappears in the composer's oratorio The Seasons as the ploughman's whistling tune. It may or may not be a surprise to you that Symphony no. 94 is out in favor of Aaron Copland's Appalachian Spring. It's the Americans versus the English (or at least one English composer, and one who adopted England as his home). It's also the concert pieces versus the ballets. Of note? Not one symphony has made it to the final round! Will the fun of American In Paris take over the dignity of Music for the Royal Fireworks? Or will the audience continue to enjoy the explosive brass sound? Which location will the voters prefer? All of The Planets? Or Appalachian Spring's view of America's heartland? Use our handy google form to decide. Before he founded Kronos Quartet, before the ensemble would go on to stretch the notion of what a quartet could be, before they would collaborate with some of the biggest names in classical music (earning 11 Grammy nominations along the way), violinist David Harrington heard a piece of music that would change everything.